Hello, my lovely little bunch of followers :) . I had a great birthday yesterday...my friend sent me a box of snacks and beauty products (including 2 Elevation polishes! ), got lots of polish and nail art supplies from my fiance, and my future in-laws gave me a gift card to Ulta! Oh, and my fiance won me a bottle of nail polish in a contest hosted by Painted Sabotage ("Greenie In A Bottle" should be available for purchase very soon). So cool! I apologize if this blog post and my next one don't have super great photos, I was a bit too absorbed in birthday festivities to care much about getting great pics lol. Today, we have Jindie Nails Guns n Roses. With the popularity of polishes like Candy Land and Princess Breath, Guns n Roses can kind of get lost in the crowd, but it's definitely worth checking out! 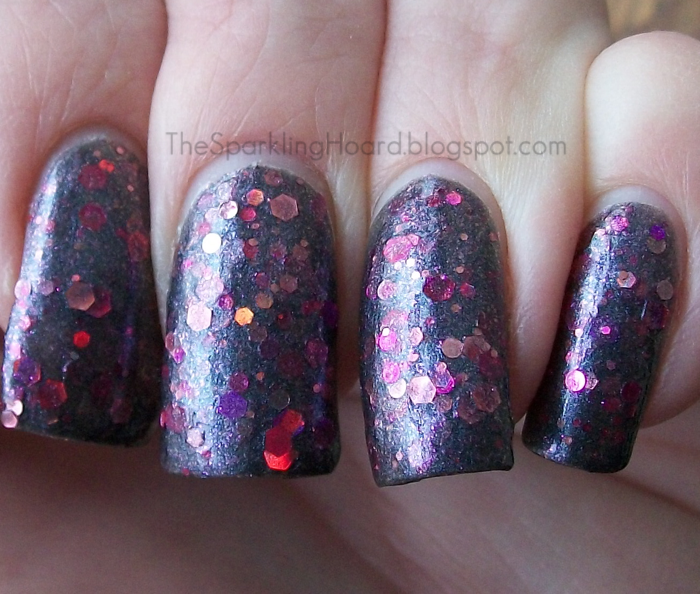 Guns n Roses features a mix of metallic and holo pink hex and circle glitters in a complex, shimmery, gunmetal base. Formula was great! I used 3 coats, but some may be able to get away with using only 2. You can buy Jindie Nails polishes on Etsy, NinjaPolish, Llarowe, and MeiMei's Signatures. Stay up-to-date on restocks and new colors on the Jindie Nails Facebook page! PS-I will forever remember this polish as the polish I was wearing when I found someone in real life who knows what indies are! My cashier at Ulta the other night asked to see my nails and when I told her what I was wearing and that it was an indie brand, she understood! So exciting!